Alcohol flush reaction is a condition in which a person develops flushes or blotches associated with erythema on the face, neck, shoulders, and in some cases, the entire body after consuming alcoholic beverages. The reaction is the result of an accumulation of acetaldehyde, a metabolic byproduct of the catabolic metabolism of alcohol, and is caused by an aldehyde dehydrogenase 2 deficiency. Facial flushing. Before (left) and after (right) drinking alcohol. A 22-year-old Asian man who is ALDH2 heterozygote showing the reaction. Approximately 36% of East Asians (Chinese, Japanese, and Koreans) show characteristic physiological responses to drinking alcohol that includes facial flushing, nausea, headaches and a fast heart rate. The back of an Asian man showing alcohol flush reaction. Other effects include "nausea, headache and general physical discomfort". 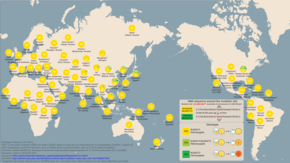 Around 80% of East Asians (less common in Southeast Asia and the Indian subcontinent) have a variant of the gene coding for the enzyme alcohol dehydrogenase called ADH1B, whereas almost all Chinese, Japanese, and Korean people have a variant of the gene called ADH1C. These variants result in the alcohol dehydrogenase enzyme converting alcohol to toxic acetaldehyde at a higher efficiency than other gene variants (40- to 100-fold in case of ADH1B). In about 50% of East Asians, the increased acetaldehyde accumulation is worsened by another gene variant, the mitochondrial ALDH2 allele, which results in a less functional acetaldehyde dehydrogenase enzyme, responsible for the breakdown of acetaldehyde. The result is that affected people may be better at metabolizing alcohol, often not feeling the alcohol "buzz" to the same extent as others, but show far more acetaldehyde-based side effects while drinking alcohol. Genotype frequency distribution of ALDH2 (rs671). 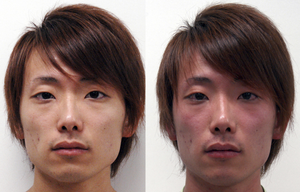 Alcohol flush reaction is best known as a condition that is experienced by people of East Asian descent. According to the analysis by HapMap project, the rs671 allele of the ALDH2 responsible for the flush reaction is rare among Europeans and Sub-Saharan Africans. 30% to 50% of people of Chinese, Japanese, and Korean ancestry have at least one ALDH2 allele. The rs671 form of ALDH2, which accounts for most incidents of alcohol flush reaction worldwide, is native to East Asia and most common in southeastern China. It most likely originated among Han Chinese in central China, Another analysis correlates the rise and spread of rice cultivation in Southern China with the spread of the allele. The reasons for this positive selection aren't known, but it's been hypothesized that elevated concentrations of acetaldehyde may have conferred protection against certain parasitic infections, such as Entamoeba histolytica. Those with facial flushing due to ALDH2 deficiency may be homozygotes, with two alleles of low activity, or heterozygotes, with one low-activity and one normal allele. Homozygotes for the trait find consumption of large amounts of alcohol to be so unpleasant that they are generally protected from esophageal cancer, but heterozygotes are able to continue drinking. However, an ALDH2-deficient drinker who drinks two beers per day has six to ten times the risk of developing esophageal cancer as a drinker not deficient in the enzyme. The idea that acetaldehyde is the cause of the flush is also shown by the clinical use of disulfiram (Antabuse), which blocks the removal of acetaldehyde from the body via ALDH inhibition. The high acetaldehyde concentrations described share similarity to symptoms of the flush (flushing of the skin, accelerated heart rate, shortness of breath, throbbing headache, mental confusion and blurred vision). Since the mutation is a genetic issue, there is currently no cure for the flush reaction. Alcohol-induced respiratory reactions including rhinitis and exacerbations of asthma appear, in many cases, due to the direct actions of ethanol. Rosacea, also known as gin blossoms, is a chronic facial skin condition in which capillaries are excessively reactive, leading to redness from flushing or telangiectasia. Rosacea has been mistakenly attributed to alcoholism because of its similar appearance to the temporary flushing of the face that often accompanies the ingestion of alcohol. Degreaser's flush—a flushing condition arising from consuming alcohol shortly before or during inhalation of trichloroethylene (TCE), an organic solvent with suspected carcinogenic properties. Carcinoid syndrome – episodes of severe flushing precipitated by alcohol, stress and certain foods. May also be associated with intense diarrhea, wheezing and weight loss. Red ear syndrome, thought by many to be triggered by alcohol among other causes. ^ a b c d e Brooks PJ, Enoch MA, Goldman D, Li TK, Yokoyama A (March 2009). "The alcohol flushing response: an unrecognized risk factor for esophageal cancer from alcohol consumption". PLoS Medicine. 6 (3): e50. doi:10.1371/journal.pmed.1000050. PMC 2659709. PMID 19320537. ^ a b Lee H, Kim SS, You KS, Park W, Yang JH, Kim M, Hayman LL (2014). "Asian flushing: genetic and sociocultural factors of alcoholism among East asians". Gastroenterology Nursing. 37 (5): 327–36. doi:10.1097/SGA.0000000000000062. PMID 25271825. ^ a b J. Yoo, Grace; Odar, Alan Y. (2014). Handbook of Asian American Health. Springer (published April 23, 2015). p. 132. ISBN 978-1493913442. ^ Brooks PJ, Enoch MA, Goldman D, Li TK, Yokoyama A (March 2009). "The alcohol flushing response: an unrecognized risk factor for esophageal cancer from alcohol consumption". PLoS Medicine. 6 (3): e50. doi:10.1371/journal.pmed.1000050. PMC 2659709. PMID 19320537. ^ a b c Peng Y, Shi H, Qi XB, Xiao CJ, Zhong H, Ma RL, Su B (January 2010). "The ADH1B Arg47His polymorphism in east Asian populations and expansion of rice domestication in history". BMC Evolutionary Biology. 10: 15. doi:10.1186/1471-2148-10-15. PMC 2823730. PMID 20089146. ^ "Disulfiram". MedlinePlus Drug Information. Retrieved 15 November 2012. ^ a b Eng MY, Luczak SE, Wall TL (2007). "ALDH2, ADH1B, and ADH1C genotypes in Asians: a literature review". Alcohol Research & Health. 30 (1): 22–7. PMC 3860439. PMID 17718397. ^ Li H, Borinskaya S, Yoshimura K, Kal'ina N, Marusin A, Stepanov VA, Qin Z, Khaliq S, Lee MY, Yang Y, Mohyuddin A, Gurwitz D, Mehdi SQ, Rogaev E, Jin L, Yankovsky NK, Kidd JR, Kidd KK (May 2009). "Refined geographic distribution of the oriental ALDH2*504Lys (nee 487Lys) variant". Annals of Human Genetics. 73 (Pt 3): 335–45. doi:10.1111/j.1469-1809.2009.00517.x. PMC 2846302. PMID 19456322. ^ Oota; et al. (2004). "The evolution and population genetics of the ALDH2 locus: random genetic drift, selection, and low levels of recombination". Annals of Human Genetics. 68 (2): 93–109. doi:10.1046/j.1529-8817.2003.00060.x. ^ Wright C, Moore RD (June 1990). "Disulfiram treatment of alcoholism". The American Journal of Medicine. 88 (6): 647–55. doi:10.1016/0002-9343(90)90534-K. PMID 2189310. ^ Boulton P, Purdy RA, Bosch EP, Dodick DW (February 2007). "Primary and secondary red ear syndrome: implications for treatment". Cephalalgia. 27 (2): 107–10. doi:10.1111/j.1468-2982.2007.01270.x. PMID 17257229. Wikimedia Commons has media related to Alcohol flush reaction.